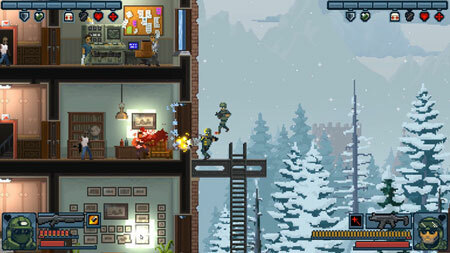 Door Kickers: Action Squad is a crazy old school side-scroller action game from PixelShard, KillHouse Games. It puts you in the role of a SWAT trooper and sends you to deal with the bad guys in Nowhere City USA. Rescue hostages, disarm bombs and save the day. Choose your gear, then kick the doors down and face the action. Adapt and react by the seat of your pants, and if needed restart without a care and rethink. Master weapons recoil and time your reloads, use distance and cover to your advantage and use the in-game Strategic Abilities to decide for yourself when healthpacks or gear refills are needed, or if that team-mate of yours is worth saving. Or just save up the Points earned and unleash your Ultimate to waltz through that tricky final room. When it gets too hard, bring over a friend to help. The game features 5 playable characters, each with unique gameplay and level up options. There are 60 non linear levels to complete, over 40 weapons and gear items, over 20 enemy types and 4 mission objectives. Unlock player and squad abilities and use them wisely. If you get stuck in the game, check out the video walkthrough and gameplay for the game. This entry was posted in PC Games, Walkthrough and tagged Door Kickers: Action Squad Cheats, Door Kickers: Action Squad Game, Door Kickers: Action Squad Gameplay, Door Kickers: Action Squad Guide, Door Kickers: Action Squad Hints, Door Kickers: Action Squad Review, Door Kickers: Action Squad Solutions, Door Kickers: Action Squad Strategy, Door Kickers: Action Squad Tips, Door Kickers: Action Squad Walkthrough by Marvin. Bookmark the permalink.